Travel all the way from Paris to hold a cooking festival in Sydney? The idea seemed rather farfetched. But when we put it to Joanna Savill who is in charge of The Sydney Morning Herald Good Food Month presented by Citi, she broke into a wide grin and simply said: that’s a wonderful idea, my dear! Not only did she approve, she also did everything she could to help Omnivore set up a young cuisine scene in this major Australian city. And that’s how Omnivore World Tour is a part of the official program of Good Food Month. Omnivore is proud and feels privileged to travel the world to discover new talents, and to organise encounters between chefs that would never have met without our events. In March of this year, the Blue Ducks and Colin Fassnidge made quite a big splash in Paris during the major Omnivore festival. The press was keen to comment on these unique chef characters and dozens of articles were written on Australian new cuisine. True to its vocation of pioneer, Omnivore returns to Sydney for a second year packed with discoveries. It is our great pleasure to introduce some young talents from the international scene to the Australian gourmet enthusiasts. Don’t miss the event! Hey everyone! 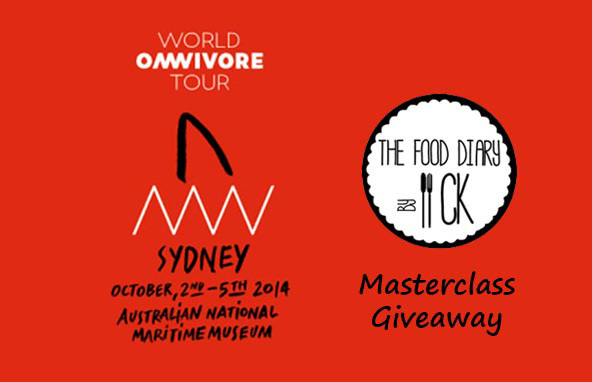 Just a quick post to let you know that we have SIX (3 pairs) day passes to the Omnivore Festival World Tour Sydney masterclasses. The tickets let you attend a whole day of masterclasses hosted by well known chefs on either Friday 3rd Oct or Saturday 4th Oct which is just a few days away! Good luck to everyone who enters the competition and don’t forget to like both our facebook page or Instagram (@fooddiarybyck) for all post updates and any future giveaways that we run! How to enter: Simply leave a comment and tell us which masterclass you’re most excited for! Closing Date: Wednesday 1st October @ 9pm. We will require a response from you within 24 hours. Have the winners all responded? Will you let us know if there are any second chances? All have responded, sorry no extra tickets to give away! Nathan Sasi is my saaassyyyy choiceeee! Pierre Sang Boyer or Carla Jones! Both would be very interesting. Natan Sasi would be amazing to learn from! Can I also use a random generator to choose the master class I’m the most interested to? it will have to be….Pierre Sang Boyer!